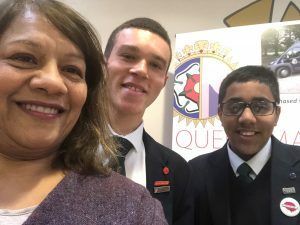 As part of UK parliament week, Kamran and Zac invited me for a Q&A at Queen Mary’s Grammar School on Friday 16 November 2018. Among the topics raised were the EU referendum and Brexit, health and well-being and delivering on Manifesto commitments. UK parliament week was from 12-18 November 2018. It is an annual festival that engages people from across the UK with Parliament, explores what it means to them and empowers them to get involved. You can find out more about UK Parliament Week here. I picture below with Zac (left) and Kamran (right).